The petition for the ban on plastic bags was launched by Animal Friends, supported by organizations such as Centre for Composting, Eko Kvarner, Eco Initiative, PCAP International, Blue World, Consumer, Green Action, The Greens of Dalmatia, Green Istria, and Green Osijek. So far, more than 27,000 people from all of Croatia have signed the petition against plastic bags. Animal Friends' representatives will on Thursday September 24 at 10:00 A.M. hand over the collected signatures to Ms. Jasenka Nekic at the Directorate for Atmosphere and Waste Management of the Ministry of Environmental Protection, Physical Planning and Construction in the Ministry's premises. On that occasion Animal Friends will present their suggestions for the solution of the big problem of plastic bags, expecting the Ministry to take concrete measures. 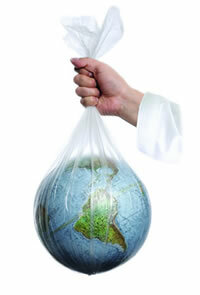 Every year 500 billion plastic bags are used and a large majority of that number ends up in nature. Hundreds of thousands of sea turtles, whales and other sea mammals die every year from eating plastic bags confusing them for food. In nature plastic bags decompose in decades into smaller pieces and after that to plastic dust which remains in the environment for another hundreds of years. Croatia has a huge consumption of plastic bags that are being handed out for free in enormous quantities in almost every store. Urgent and concrete legal solutions are needed in order to fix the alarming issue of plastic bags consumption. Plastic bag recycling is neither economic nor easily manageable. Only about 1% of the bags end up recycled. Even if the amount of recycled plastic bags would be drastically increased, that wouldn't solve the problem of their ruthless production which consumes enormous amounts of resources and poisonous chemicals. Some countries like China, Israel, Canada and South Africa as well as the cities of San Francisco and Los Angeles have already banned the free distribution of plastic bags. Ireland introduced a special tax on plastic bags and their use has meanwhile decreased by 90%. The ban on plastic bags would also have a huge educational impact since it would teach people not to consume all that can be produced, and it would also promote further steps in saving our planet. While waiting for the Ministry to legalize this issue, Animal Friends appeals to chain stores to abolish free plastic bags, thus leaving an option to their buyers either to bring their own bags when going shopping or to buy a bag. Animal Friends asks consumers to contribute to the protection of the environment and the animals by using cotton and net bags, baskets, and other reusable items.